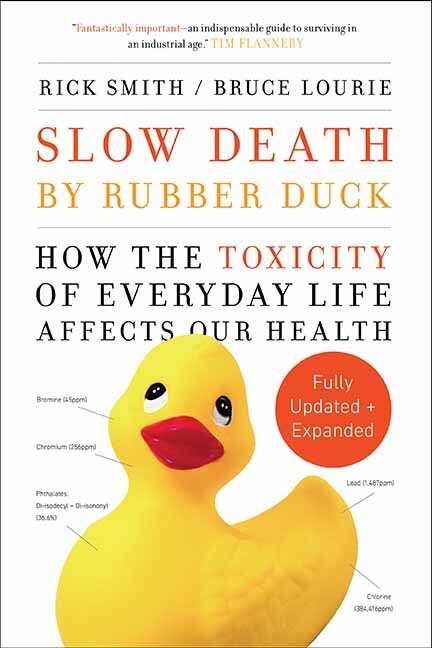 Slow Death by Rubber Duck – How the Toxic Chemistry of Everyday Life Affects Our Health. SLOW DEATH BY RUBBER DUCK: How the Toxicity of Everyday Life Affects Our Health is the landmark book about the toxicity of everyday life and is now updated, revised and re-issued for its 10th anniversary, along with the experiments from Rick Smith and Bruce Lourie’s second book,Toxin Toxout. It’s amazing how little can change in a decade. In 2009, a book transformed the way we see our frying pans, thermometers and tuna sandwiches. Daily life was bathing us in countless toxins that accumulated in our tissues, were passed on to our children and damaged our health. To expose the extent of this toxification, environmentalists Rick Smith and Bruce Lourie offered themselves to science and undertook a series of over a dozen experiments to briefly raise their personal levels of mercury, BPA, Teflon and other pollutants. The ease with which ordinary activities caused dangerous levels to build in their bodies was a wake-up call, and readers all over the world responded. But did government regulators and corporations? Ten years later, there is good news. But not much. Concise, shocking, practical and hopeful, this new combined edition of one of the most important books ever published about green living will put the nasty stuff back where it belongs: on the international agenda and out of our bodies.